45 female with giant bunion on the right foot. This bunion is really bulging beneath the skin and big toe is pushing against the 2nd toe. Dr. 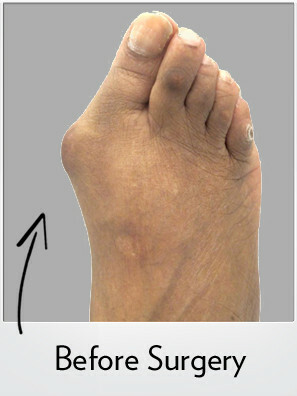 Blitz performed his Bunionplasty® procedure to keep scars off the top of the foot. The underlying bone was severely deformed and required three bone procedures to straighten everything out – Lapidus Bunionectomy using the Contours Lapidus Plate (concept developed by Dr. Blitz), a bone cut near the bit toe joint to realign the cartilage, and another bone cut to straightening out the big toe itself. hides the incision on the inside of the foot. 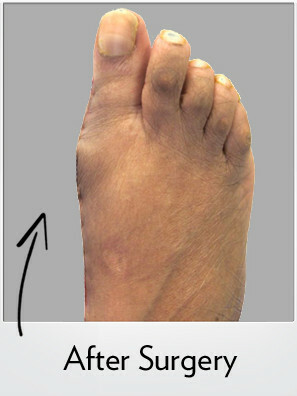 The immediate after surgery image shows “bunion removal” and a well aligned big toe which in no longer pushes against the 2nd toe.